My husband and I needed a break so it was off to Music City for a little rest, relaxation and roaming. After spending a day downtown, we decided to venture out to Cool Springs where I quickly descended on their Joann's store and cleaned them out of mitten clips for pacifier savers. From there, it was onto Franklin. Thanks to the volume of country music stars in the area, Franklin is a quaint, restored and adorable little hamlet outside of Nashville. We parked the car on a side street and headed down to the main area of town which included a street lined with boutiques and shops not to be missed. After a little window shopping and the creeping awareness that lunch might be the only thing we could afford in Franklin, I stumbled across the winter white sale at Lulu. I would have bought the whole store out if I could have, but I settled for a set of wool and velvet pillows featuring a brown, cream and grey plaid. 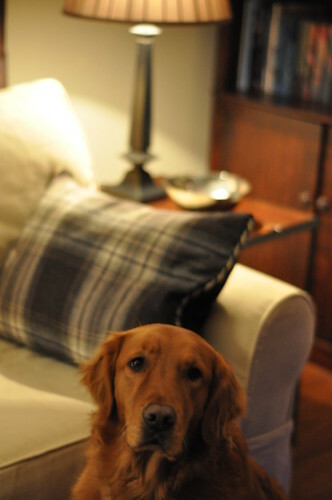 Birdie, our dog was curious about the interest I was suddenly paying the couch and snuck into the photo.